I keep on devouring these books. As soon as I'm done with one, I have to start the next one. What a fantastic world Mrs. Bishop has created! By now we know the most important players and recently we start to meet the nasty ones too. Mainly Nicholas Scratch. He's determined to make the humans turn against the Others. I can't believe humans can be so shortsighted! The Others own Thasia. They rent the place to humans. No way can you exterminate them all. If you go just by the short history at the beginning of each book, you know that in this UF world no one can't win against the Terra Indigene. One of the things that surprises me, is that despite me being a hopelessly romantic, I'm enjoying the secondary characters as much as the main couple. Yes, I want Meg and Simon to realize that they love each other but I want to learn more about the rest of the cassandra sangue and the rest of the Others. Tess is always so intriguing. She can kill with a look, literally. I love how her hair changes colors depending on her mood. I love Vlad. He can be funny but he's quite lethal too. I want to learn more about Steve Ferryman and this book made me want to learn more about Jackson too. Of course, the regular humans also intrigue me. Monty and his daughter Lizzie have a huge part in Visions in Silver and I love her interaction with Nate. Captain Burke is always super smart trying to keep the human race alive. Sam also makes a few appearances and we learn more about the Ponies, the girls at the lake and some very powerful Terra Indigene. 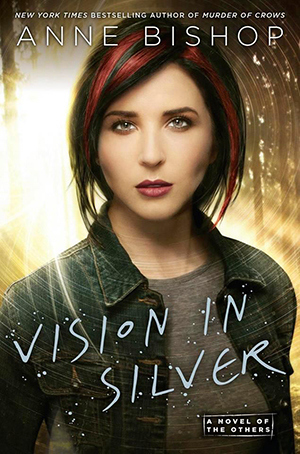 Visions in Silver has the same humor, dark scenes and character development as its two predecessors and there's nothing wrong with Anne Bishop's formula. Again, I think it's worth mentioning about how amazing the world building has been. It's truly a marvelous one. There were a couple of pivotal scenes which were game-changers for this series. I'm still not sure how Meg is going to start coping without cutting or if that is even a choice for her. I hope someone finds a solution to her addiction. After all, she can only have a thousand cuts.